A charter organised by Martin Creese. An Austerity, built by Hunslet, No. 3890 was the last standard steam locomotive built in this country for the home market (that is until the recent completion of Tornado) with an official date of construction of 19th February 1964. It was the 484th Austerity to be constructed. The locomotive became No. 66 in the South Yorkshire NCB fleet and was sent to Cadeby Main Colliery, Conisborough on 27 March 1964. The locomotive was originally fitted with a mechanical stoker to assist in one-man operation, and a gas producer to reduce smoke emissions - both a brave attempt to extend the life of the steam locomotive. Further details of this system are provided in the description of Austerity locomotives. The gas producer system and mechanical stoker fell into disuse, and conventional methods of firing were adopted, an ordinary grate being fitted. This meant that when the Conisborough area was designated a smokeless zone in 1970, the locomotive had to be replaced by an ex-BR diesel shunter. No. 66 was out of use at Cadeby Main Colliery from 1970, and a number of years later put up for sale. 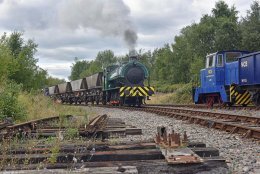 A Quainton member was the successful tenderer, out of 20 other potential buyers, including the NRM at York. The locomotive was complete and there were spares, including eight sets of brake shoes, firebars, springs and tools included in the sale. No. 66 was delivered to Quainton on the 4th November 1975. A number of years later the locomotive became the property of QRS. Whilst the locomotive was complete and generally in good order when it arrived at Quainton, there was one significant problem that stopped its use for many years - the condition of its tyres. When No. 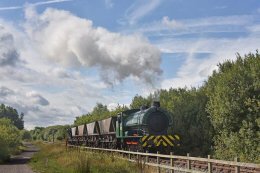 66 worked at Cadeby Colliery her duties included hauling trains of coal wagons over the two mile straight track to Mexborough. Gradients were quite severe but the worst part was a length of about ¼ mile near the washing plant where the rails disappeared under six inches of slurry. The effect of this abrasive on the tyres and the brake blocks can be imagined, and the copious use of sand, up to ¼ ton a day per loco, was a good way to machine a grove of rail width into each tyre. After many years awaiting a heavy overhaul, including a requirement for major tyre renewal works, No. 66 entered the restoration queue. The chassis was sent away for partial overhaul to South Coast Steam. The chassis returned to Quainton during 2009, with some outstanding work to be completed at Quainton. The boiler was sent to Locomotive Maintenance Services at Loughborough for contract repair and overhaul. The tested boiler returned to Quainton in June 2014, and was immediately craned into the frames of the rolling chassis. The boiler was steamed in frames and then a new smokebox was fitted, followed by the cab roof, chimney and tanks. NCB No. 66 was successfully returned to public service during the May 2015 Steam Gala.